Lunar Series II coins feature immense variety of option for investors and collectors. Both the silver and gold versions of the coin are available as proof specimens, and in limited cases there are colorized coins with unique designs that still represent the series but diverge from the standard Year of the Goat designs. 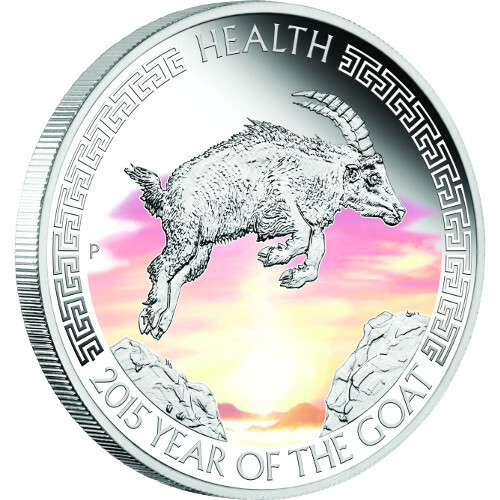 Right now, the 2015 1 oz Proof Colorized Silver Australian Goat Good Fortune Health coin is available on Silver.com. Arrives in a beautiful display box. Mintage limited to 5,000 coins only. From the Lunar Series II collection. Commemorates the Year of the Goat. Bears a face value of $1 (AUD) backed by Tuvalu. 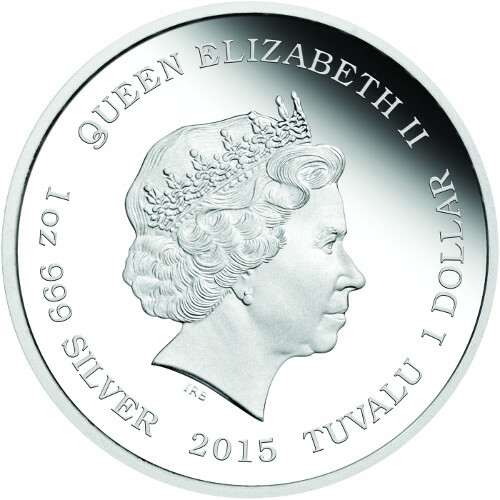 Queen Elizabeth II graces the obverse. Colorized Year of the Goat on the reverse. 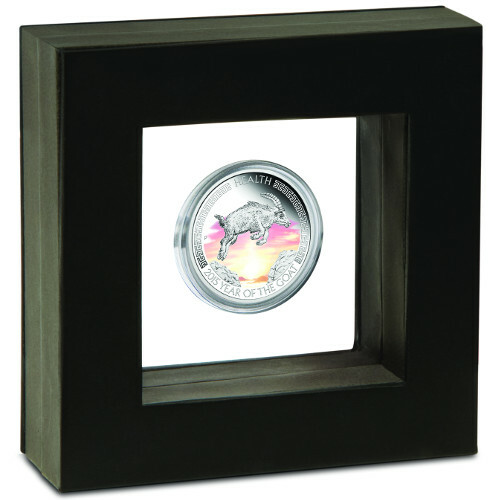 All 2015 1 oz Proof Colorized Silver Australian Goat Good Fortune Health Coins in this product listing ship to you in a beautiful display box to protect your coin’s finish and condition. Included you’ll find a numbered Certificate of Authenticity. These silver proof colorized coins are part of the Perth Mint’s Lunar Series II good fortune collection, which also includes a wealth and wisdom coin design. Each one features a different take on the Year of the Goat design, with colorized background fields instead of colorizations added to the animals. 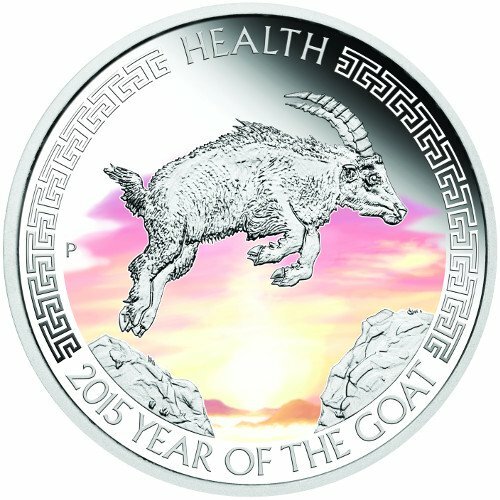 On the reverse of the 2015 1 oz Proof Colorized Silver Australian Goat Good Fortune Health coin you’ll find a goat as it jumps across a pass in the mountains. Like other coins in the collection, this product features a silver finish on the goat and brilliant colorization for the background field, with a beautiful sunrise in red and orange hues. 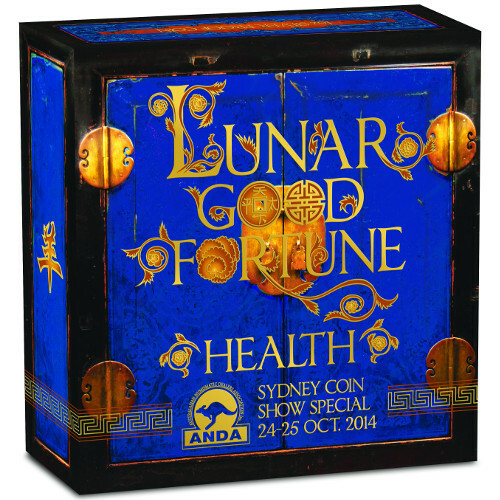 Lunar Series II is a 12-coin release from the Perth Mint that follows the cycles of the Zodiac. The Chinese Lunar Calendar turns over every 12 years, with a different animal representing each different birth year. Perth Mint was founded in 1899 as part of the British Royal Mint system, but just three years ahead of Australian federation. The mint served as a primary facility during the transition to an independent nation, and following the closure of the Sydney Mint and Melbourne Mint, stands as the oldest operating facility in Australia. If you have a questions for Silver.com customer service, please feel free to contact us. Our associates are available at 888-989-7223, online using our live web chat feature, or via our email address.